This is a wrestling story…but with a twist. I won’t pretend I “accidentally” got involved; wrestling is a way of life for my town; the town of Grundy, Virginia. Not much of a town is left, the Army Corp of Engineers decided to move our town so we are left with a huge rock cliff and a fancy new “four-lane” as we call it. Grundy is small and nestled in the southern Appalachian Mountains in the southwest part of the state, population of 1,200, and we wait patiently on a Wal-Mart. It will be a multi-level one-of-a-kind and the only one within 40 miles. Our high school, where I taught for 21 years has an enrollment of about 400 students. In spite of these obstacles, Grundy Wrestling is well known throughout the country. We have won 12 state titles, been ranked nationally, honored by the VA House of Commons, been the subject of documentaries and most important to me, helped me to raise two fine young men. The story starts with the disintegration of my family in 1995. I was a high school teacher with 2 children expecting a third. My oldest child, a daughter named Mackinzie was 8 and had been recently diagnosed with a rare form of cancer. She was immediately sent to St. Jude’s Children’s Research Hospital in Memphis; an 11- hour drive from Grundy. I was 8 months pregnant and stumbled while packing for our trip. I needed surgery on my knee, but would have to wait until the baby was born. My husband of 11 years decided that he no longer wanted to be a part of our family. He chose alcohol over us. My middle child, Kaleb, had been wrestling since he was 4. He was 6 at the time his sister was diagnosed and this is the time that wrestling became my family instead of just a sport. 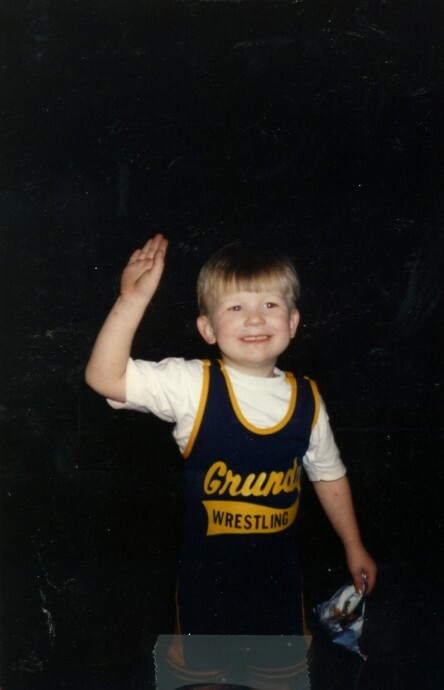 Grundy Wrestling gave Kaleb a place where he could be a boy, and later the man that we needed to make our family work. With 3 young children, one who was sick and I in a cast for almost 2 years, wrestling became a way of life for Kaleb. While I was with my daughter at St Jude’s. or caring for a baby….wrestling was there for Kaleb. During Mackinzie’s illness, wrestling showed it’s ugly side, a variety of serious injuries to Kaleb. A torn labrum, a torn bicep, torn ligaments, and broken bones that resulted in a total of 5 surgeries in three states. My insurance company had to wonder what was going on in my home! The twist recently happened, I realized that the pattern is happening with my son Trey; the baby who I carried through my Oprah-worthy crisis. I not only see it occurring with Trey, but with other boys who are on the team. Over a period of years it became clear that Grundy Wrestling does this as a standard operating procedure, not just for a familbe y who is having a tough time. They do it for all wrestlers. The voids that are filled may be different than they are for my kids, but they are always filbe led. The needs are always met. It may that someone may need dental treatment. It may be that someone’s mother is dying from cancer. It may be that someone just needs a substitute “dad”. No matter what is needed, the wrestling club is there. It was there for me, it’s there for my kids and its there for every single wrestler. Today, I travel all over the Eastern US to support Grundy Wrestling. I am the head scorer for tournaments sponsored by the team. My daughter is cancer free, healthy and happy as a senior in college. Kaleb is a college junior, majoring in athletic training; sports and recreation. And Trey, he’s a freshman on Varsity for Grundy Wrestling Club. He has been in the Virginia Middle School State Finals 3 times, and placed second each time. While frustrating, these second place finishes still make me happy. I’m happy that our family made it through some serious struggles and with the help of wrestling… I know we have finished first! I so love your story, Stephanie. I admire your strength and resilience and love for your family. And I totally get it about being held up by your larger wrestling family. I remember when Mac got sick! I really remember you being pregnant with Trey, and of course Kaleb! I know you went through a very rough time, and I am glad the wrestling club was their for you. What you failed to mention was how through all of this you were still there for your students. I remember you coming into class one day crying. You informed us that it was okay to cry in your class, because it cleansed the soul. You also told us if anyone made fun of us for crying to have them come see you! You were awesome!!!! Stephanie, a great story of you life and tribute to the Grundy Wrestling association. I got Alex involved when he was small and I also agree it was a very positive part of his life and maturity. Thanks for writing this for all the wrestling parents and supporters..
You are an amazing woman and mother. You have done an incredible job raising your children and are an inspiration to many. Wow…thanks guys. Your comments mean so much to me. Christina, you’ll never know how much I appreciate you sharing that with me. I remember that day and I’m glad you do too. Its been a pleasure to have the opportunity to be associated with the success of two fine young men! 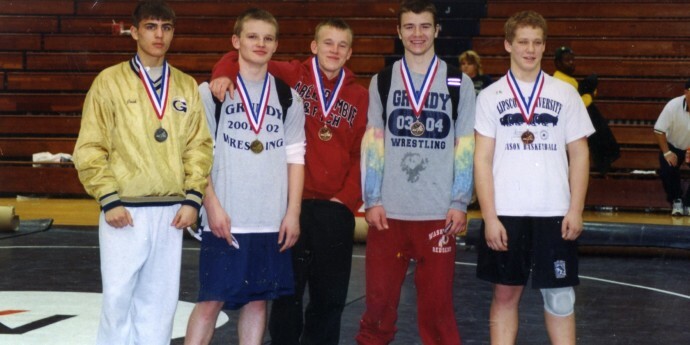 What a fabulous story~ You and yours and Grundy Wrestling are awesome! What a great story! You and yours and Grundy Wrestling are awesome! What a great story! You and yours and Grundy Wrestling are awesome!! Beautiful Story…being from Grundy I can relate. I have not been back in many years but your perserverance is incredible!